In an interesting turn of events (and some expert sleuth work), another Motorola Android device has been confirmed to be T-Mobile USA bound. Reportedly, the device in question is the Sholes Tablet, or the Motoroi. The phone was seen waltzing around the FCC with ID IHDP56KC6 (certified for quadband EDGE plus T-Mobile-friendly 1700 / 2100MHz HSPA with a peak of 10.2Mbps down and 5.6Mbps up), bluetooth, GPS, Magnetic Compass, WiFI and a 1390 mAH battery. If this is anything like the Korea bound Motoroi, it will have a 3.7-inch capacitive WVGA display, 8 megapixel camera with 720p video capture, HDMI-out, the same OMAP3 core as the DROID, BLUR and multitouch is questionable. Look for this thing in March, head past the break for all sorts of goodies and don’t forget to leave your thoughts in the comments! first comment!! ow yea im definatly going to get this in march!!!! damn u dave first comment!!!!!! Told y’all. I put a speculation post of this in the forum. I CAN’T WAIT!! That thing will be mines!! Nice specs, but why are manufacturers steering away from freakin keyboards!? imo because of the success of the &*^%$ iphone. I knew about this phone a few months ago. I got to hold it and play with it back in December. At the time it was only running 1.5 with Blur, just like the Cliq, but was super quick. The little bump on the side looked a little weird but work. Going to be a sweet phone and should have 2.1 when its released. NOW WE GET THE HIP!!!! Not a good option unless you want three year old hardware and a low res screen like G1 and MyTouch. Well I spoke with a T-Mobile Rep last Saturday asking him about if the nexus one and if it was going to be sold in stores he told me more than likely and that we would know by February also he said there was a tablet coming to be released in early March i believe this must be what he is talking about we also spoke about the Nokia N900 which he said they are getting it in March so it looks to me that March will be a busy month for T-Mobile I cant wait to see whats next. Damn I would totally drop my Cliq for this ! This will make me leave my blackberry! Come on T-Mobile! Get this and bring the Nexus to us and away from google!! Blur is great. I use Status, Happenings, and Messages widgets constantly. If you don’t like them, easily dragged to the trash can and your real estate is all yours. Also, having extra home screens makes up for any additional space taken up by the Blur widgets. Anybody know what processor this will have in it? Snapdragon? It’s going to have the same as the droid, OMAP3430 Cortex A8 :) So a little less powerful than a snapdragon, but that dedicated GPU can make up for it. It will not be a slouch by any means. Good deal I guess. 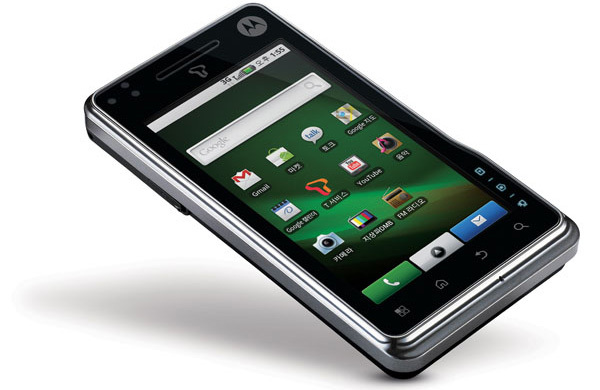 I would MUCH prefer TMobile got the Motorola Shadow though. I am waiting for something with snapdagon and a keyboard. Looks cool. Glad T-Mobile is brining in the hottest phones in NAM! I think this is the most “professional” looking android device yet. I’m excited and hope I actually get this to sell. I thought tmobile was going to get the “zepillin”? I was really looking forward to this phone until I found out that it will have blur. I prefer the stock android to the skinned versions. Not to mention the stock version always gets updates first. I’ve seen this on a few other sites and it looks nice, like the form factor and it has a flash. But it lacks the most important thing, a physical keyboard. So I won’t be giving up my Cliq for this, and I will be keeping it for at least a year. Ugh I don’t know why so many of you are jumping on this…what about the HD2 launching in the same month? Way better, Snapdragon, Sense and that ridiculous 4.3″ screen. Yea yea I know it’s WinMo but Sense does a good job of covering it up and bringing you a GREAT experience. Or you have the Nexus One……I was about to buy the Nexus One but I’m going to wait for an HD2 if I don’t cave and buy a N1 this week. -_- If I do then I’ll just wait for the HD2 after that. I have a G1 right now and wish a beast phone would come out with a physical keyboard but I’m losing hope so might as well jump on a Nexus One or an HD2, those are going to be the 2 best phones out this year, on T-Mo prolly fa sho. @Mockerfab4: Not entirely. You can come close, but a soft keyboard will never be right. lol. From everything I’ve found so far the Sholes Tablet could be as good as the Nexus One. If so and with T-Mobile Upgrade paths, it might be the better way to go. I held off on the Nexus One after catching the Sholes Tablet rumors so I’ll decide in March. Looks nice, hopefully it’ll come with multi-touch, but Blur-free. Forward progress, Android and Android Devices…! Loving it!! ;-). This phone not for me, but damn…its EXCITING!! I am happy for T-Mobile ’10. They have started the year great!! It’s either this or the SE Xperia X10 for me. It all depends on Sony. Timescape and Mediascape seem better to me than “Blur” but if Sony releases Xperia X10 with 1.6 when 2.1 s available that is a FAIL! I’m in agreement with everyone, they should make a phone with a physical keyboard, but not a deal breaker for me. I heard this phone is equipped with Xenon Flash, and put it with an 8 Megapixel camera … pictures should be great quality. Decisions … Decisions … but I know my G1 will be getting the boot sometime this year! It seems laggy as hell. No way it’s running a 1GHz processor. when did you play with it to say its laggy as hell? Sholes Tablet FTW. Must have NAO, plz. Released yesterday- missing the Motoroi??? I WANT THIS PHONE!!!!! I’m cool with some Tmo Reps at the store near my job and one of them was telling me he’s not sure if they are getting the Motoroi phone yet. They received orders for the Cliq XT, Nokia Nuron, and the HTC HD2 and those he knows they are getting those. So I don’t know if they are keeping this one a secret, cause everywhere I read they say Tmo could be getting this phone in March. So we’ll see, but I’m praying it comes. Yeah, we’re definitely in need of a good phone on T-Mo. I have an N1 now, but the radio issues are driving me nuts. I need a phone that WORKS. I sure hope they get this soon, and that it doesn’t have the deal-breaking “blur” on it. Any news on the release of this yet. I really want.